Last night at table Br Mateusz stated that back in his village in Poland the temperature last week was -27 c. While our jaws dropped to the floor, he continued calmly, that last year the lowest was -39 c!! Worse is that sometimes in summer the temperature touches a high of 30 c! Well that's quite a fluctuation. Compared to the rather stable temperature UK enjoys and the chaos ensuing any change in the temperature on either side of the scale, people in places like Poland must surely be well 'acclimatized'. 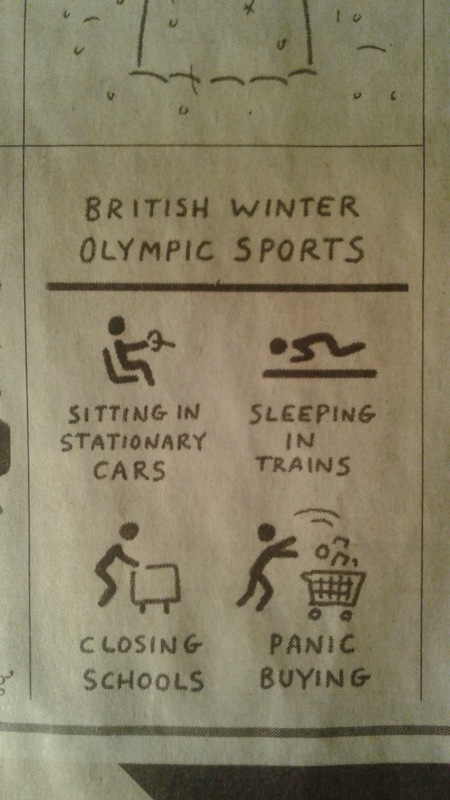 The following cartoon from the paper a couple of days ago, best describes the British situation in snow!